To determine the genetic factors influencing grain β-glucan content, that were effective in a population of two-row barley grown in very contrasting environments, 102 doubled haploid lines from the cross Beka × Logan were sown at two sites, Lleida (N.E. Spain) and Dundee (E. Scotland) in 2002. Following harvest, grain samples were assessed for total β-glucan content. Beka had lower β-glucan content than Logan at both sites but, while there was transgressive segregation among the DH lines, this was primarily amongst lines with higher β-glucan than Logan. In addition to differences between DH lines, there were differences between the sites and there was also genotype × site interaction. Three QTLs for β-glucan content were detected at both sites, but their contribution to β-glucan content was, in all cases, higher at Lleida compared to Dundee. One QTL was located in the distal end of the long arm of chromosome 1H, in the same region as a gene for UDP-glucose-4-epimerase, an enzyme known to be involved in the synthesis of cell wall polysaccharides, while another was located in the same area of chromosome 5H as a genetic factor shown previously, in the same cross, to influence grain protein content. The third was in the centromeric region of chromosome 7H, close to the gene for naked (hulless) grain. 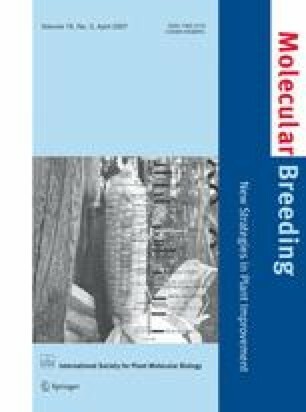 These findings will be important in designing crosses and devising selection strategies in breeding of both low β-glucan, malting barley and high β-glucan, hulless barley for human food use. The Spanish groups are funded by Comisión Interministerial de Ciencia y Tecnología (CICYT). JS Swanston and JR Russell are funded by the Scottish Executive Environment and Rural Affairs Department (SEERAD). We want to thank Drs WTB Thomas and L Ramsay for their helpful discussion of the manuscript.